GT4 is one of the least extreme specs for race cars. Outside of one-offs like the wacky enclosed KTM X-Bow, these cars look pretty normal, and approachable, without a lot of the insane aerodynamic aids you’d find on a GT3 or GTE spec race car. 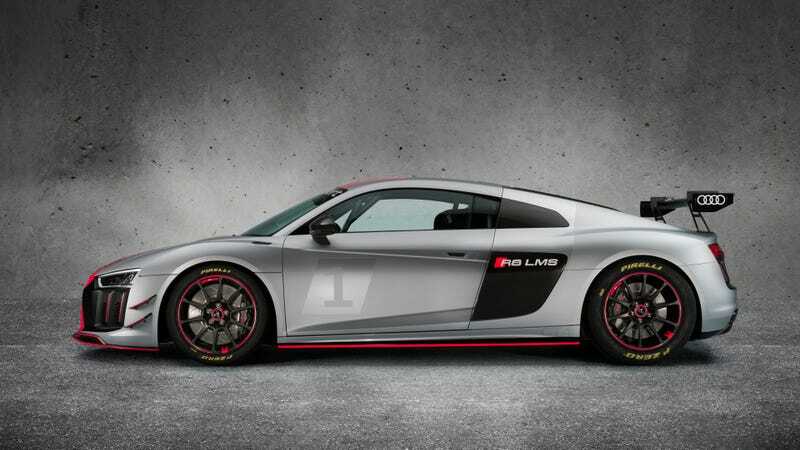 As such, the R8 LMS GT4 shares 60 percent of its components with the road-going R8, according to Sportscar365. It’s even produced on the same assembly line as the R8 Coupe V10. Powering the deceptively normal looking Audi is a roaring 5.2-liter V10 mid-mounted engine, which produces up to 495 horsepower to meet the GT4 spec rules. GT4 cars compete in the Continental Tire Sports Car Challenge’s GT class and the Pirelli World Challenge GTS class in the United States, along with eleven other GT4-spec sports car series around the world. Audi’s new GT4 competitor will make its debut next month at the Nürburgring 24 Hours. Customer teams who order a new R8 LMS GT4 will start to receive them before the end of the year.